People spend thousands of dollars on private investigators. Private investigators do a variety of different jobs, like spying on people and documenting their findings. The most common investigation they conduct is when a wife or husband suspects their spouse is cheating on them. And, they want the investigator to find out for sure. This means the investigator must follow the spouse and take pictures of where they go. But how does a private investigator go about following someone? This method hasn’t changed too much in the last 30 years. 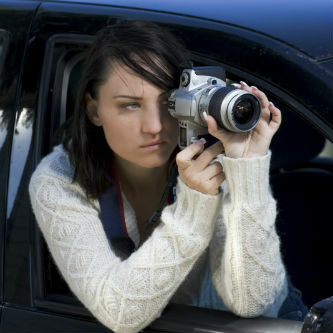 Private investigators still must follow the person in their cars while keeping a safe distance. Because they do not want to be spotted. And, if the person has a smartphone and the investigator cannot find them on the road. They can still be tracked via the GPS signal of their phone. This means investigators don’t have to worry about rushing through traffic to stay behind the person and risk getting into an accident over it. Instead they can just look at the map screen on their smartphone to find the person’s current location. When it comes to taking pictures and recording what the person is doing that you are following, this has gotten much easier. Investigators don’t have to carry big flashy cameras to take pictures anymore. Now an investigator could be within feet from the person they are following and still take their picture without them knowing it. All of this can be done through their smartphone. The investigator can just take out their phone and pretend they are texting someone. But, they will be taking pictures. What’s even better is they can record video on their smartphone. So, if a cheating spouse is at a restaurant with their lover, the investigator can just take out their smartphone and video record the event. Doing so without drawing attention as to what they are really doing. When it comes to researching background information. This has also gotten easier. All an investigator must do is go on Google and type in the name of the person and their last known location. If they have an active address and phone number. A private investigator can find them. Search engines will also help investigators find social media profiles. And these profiles can provide even more revealing information. People often post revealing pictures on their social media profiles. Then if the research involves finding the person’s employment background. LinkedIn can sometimes provide that information. The internet is a crucial private investigator surveillance tool that gives investigators access to a wide range of information, both public and private. They can search courthouse records, marriage records, employment records and more. Between the internet and the smartphone, an investigator has most of the tools they need to follow and document just about anyone.